Vermont's next governor, Republican Phil Scott, waved to supporters as he awaited the election results at the Sheraton on Tuesday evening. Lt. Gov. Phil Scott arrives at the GOP election watch party at the Sheraton hotel in Burlington with his wife, Diana McTeague-Scott. Rep. Peter Welch, who has cruised to re-election for his sixth term in Congress, spoke to supporters at the Hilton hotel in Burlington on Tuesday night. Supporters cheer "Go Trump"! at the Vermont GOP election headquarters at the Sheraton hotel in Burlington. People wait for election results to come in at the Vermont Democratic Party election headquarters at the Hilton Hotel in Burlington on Tuesday evening. A last-minute voter goes to the polls at the Sustainability Academy at Lawrence Barnes in Burlington on Tuesday evening. Shelburne resident Charlie Laud leaves his local polling location with an "I Voted" sticker on Tuesday morning. Sarah Southall and her son Holden, both of Elmore. Holden just turned 18 and is a first-time voter. Electioneers campaign outside of the Frederick H. Tuttle Middle School polling location in South Burlington on Tuesday morning. Mendon Town Manager Sara Tully, with her 5-month-old daughter Lilyanna Tully. A cake in Mendon. Looks delicious. Signs and voters outside the Ward 6 polling place at Edmunds Middle School in Burlington. CVU students from an AP U.S. Government and Politics class sort through absentee ballots at the Shelburne Town Center Gymnasium on Tuesday morning. Vermont-shaped cookies at the Frederick H. Tuttle Middle School PTO's bake sale at the South Burlington polling location on Tuesday morning. Amsden resident Bill Bushaw, who says he was previously a longtime Democrat, stand with a sign supporting Donald Trump at outside the Weathersfield Town Office. South Burlington voters wait in line at the Frederick H. Tuttle Middle School in South Burlington on Tuesday morning. Brothers-in-law Ed Lambert, left, and Val Gorham, both of Morrisville, met up to chat in the parking lot after voting. JoAnn Sullivan, left, and Joan Rost hand out chocolate kisses as they check in voters Tuesday morning in Pittsford. Morning sun shines outside the polling place at the Winooski Senior Center. A crowded polling place in Shelburne. Results from the Associated Press are unofficial pending certification. Final update 12:25 a.m. Republican Randy Brock has conceded to Progressive/Democrat David Zuckerman in the race for lieutenant governor. Full story here. Update 11:58 p.m. Voters in Burlington passed all ballot questions on the local ballot. The ballot measures included new zoning provisions to allow buildings up to 160 feet — which would enable the planned redevelopment of the Burlington Town Center mall — and the creation of a Tax Increment Financing district to fund infrastructure improvements near the mall. Other ballot items in the city included an $8.3 million bond to improve the city’s water infrastructure, and a vote to authorize the city to relocate the Burlington bike path. Elsewhere Westford voted to purchase 130 acres of the former Jackson farm for a town forest and conserve another 42 acres as a working farm. In Newfane, voters rejected a bond proposal for a new municipal office building. Update 11:51 p.m. Races that remain to be called or have yet to see an opponent concede are for lieutenant governor and auditor. According to AP, with 90 percent of precincts reporting, Progressive/Democrat David Zuckerman leads Republican Randy Brock 52 percent to 46 percent in the race for lieutenant governor. Meanwhile, in the race for auditor, incumbent Progressive-Democrat Doug Hoffer leads Republican Dan Feliciano, 56 percent to 39 percent. 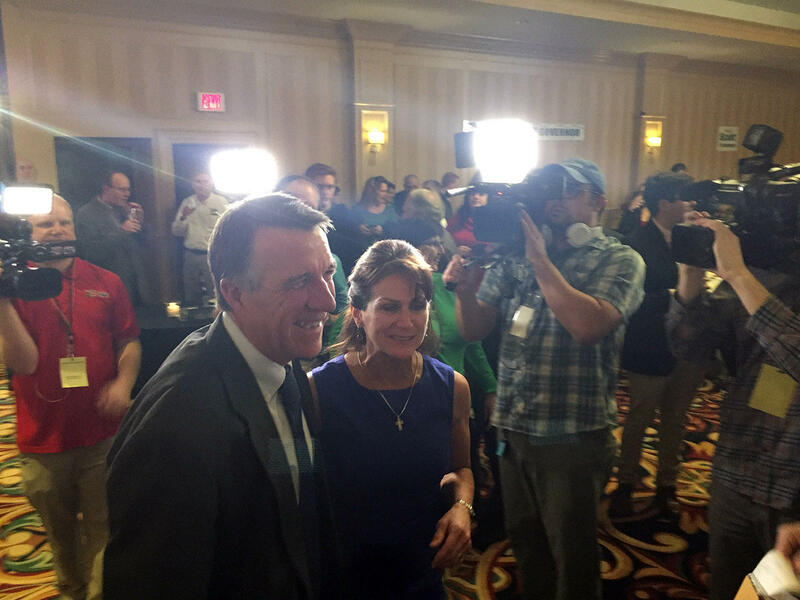 Hear Governor-elect Phil Scott's full victory speech. Scott made no reference to the presidential race, which currently hangs in the balance, with Donald Trump's path to victory open and Hillary Clinton's narrowing. Democrat Sue Minter thanks supporters after conceding the race for governor to Republican Lt. Gov. Phil Scott. "Nothing ends with tonight," she said. 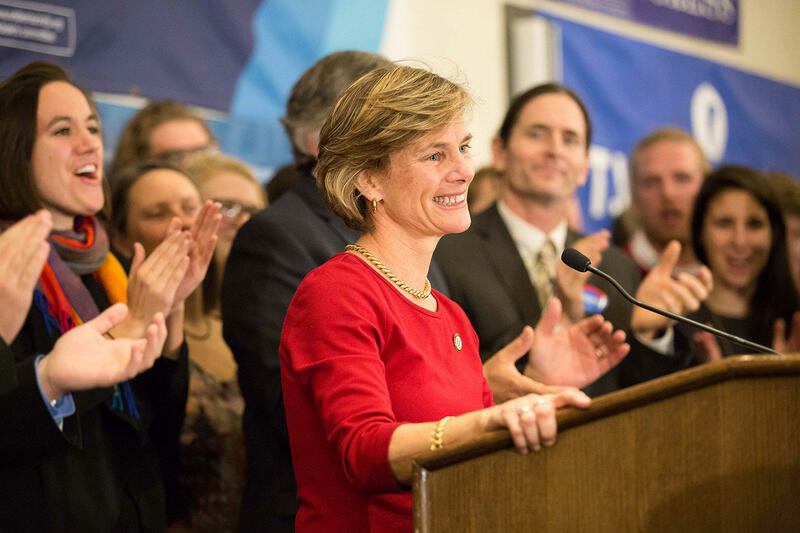 Hear Democrat Sue Minter's full concession speech. Minter enumerated the themes she has sounded throughout her campaign. “Nothing ends with tonight,” she said as her family gathered around her. Update 11:10 p.m. Sue Minter hasn’t been circulating at the Democratic election event, but she’s about to speak. Much anticipation about what she’ll say; listen live on our site player (above). Update 10:45 p.m. Results from the fourth of the five mirror towns are in, and if these towns are voting as they have historically — in a way that reflects the statewide results — it doesn’t bode well for Sue Minter’s prospects. In Randolph, Phil Scott garnered 59 percent of the vote to Minter’s 38 percent. Bill Lee received 3 percent. Update 10:28 p.m. Voters have rejected the state’s largest wind project, proposed for Grafton and Windham. In Windham there were 181 "no" votes and 101 "yes" votes. In Grafton, the vote was 235 against and 158 in favor. Turnout in both towns was more than 75 percent. The votes aren’t binding, but the Spanish company Iberdrola has said it would not build the project without local support. Update 10:06 p.m. Bethel is the third "mirror town" to report, in addition to Cambridge and Jericho. In all three of these towns, which historically reflect the statewide results, Republican Phil Scott has out-polled Democrat Sue Minter. In Bethel Scott received 555 votes, Minter 423. We’re seeing ticket splitting in Cambridge and Jericho. Voters are favoring the Republican candidate for governor and the Democratic candidate for president. In Cambridge, for example, Scott and Clinton received 1,552 and 2,035 votes respectively; Minter received 570 fewer votes than Clinton. T.J. Donovan will be Vermont's first new attorney general since 1997; he replaces outgoing William Sorrell. Update 9:17 p.m. Republican Deb Bucknam has conceded the race for attorney general, congratulating Democratic opponent T.J. Donovan. “During an election season filled with negativity tactics, it was refreshing that we both ran a civil and issues oriented campaign,” Bucknam said in a statement. Liberty Union candidate Rosemarie Jackowski is also running for attorney general. Update 9:04 p.m. We’re awaiting the official tally from votes in Windham and Grafton on the controversial Iberdrola wind project. Unofficially, one of the opponents says the the Grafton vote was 235 no, 155 yes. A second "mirror town," Jericho, has weighed in and Scott prevailed there as well, with 1,702 votes to Minter's 1,548 votes. Update 8:58 p.m. Phil Scott arrives to cheers at the Republican election night event in Burlington. There are also cheers of “Go Trump" from supporters. Update 8:52 p.m. Results from Cambridge are in, and Scott has out-polled Minter, 1068 to 808. Cambridge is the first one of the five “mirror towns” to report. In the past, these towns typically reflect the final statewide results. Update 8:50 p.m. Sue Minter has lost her hometown of Waterbury to Phil Scott, 1465 votes to 1552 votes, respectively. Democratic Sen. Patrick Leahy acknowledges supporters after winning re-election over Republican challenger Scott Milne. Update 8:37 p.m. Patrick Leahy is speaking to party faithful at the Democratic gathering this hour. He was introduced by his grandson and wife and spent time recapping his long Senate career, with an up-to-date reference to the vacant Supreme Court seat, cajoling Republicans to "do their job" and fill the vacancy. 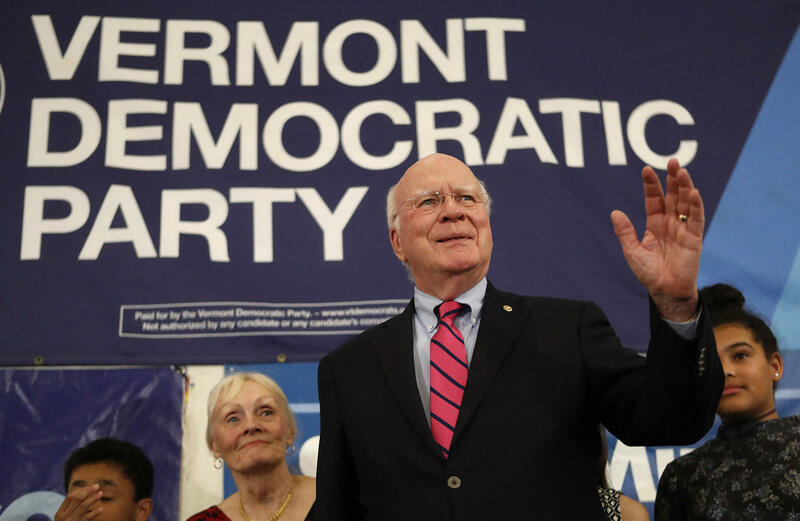 Hear Sen. Patrick Leahy's full victory speech. Leahy was 34 when he was first elected in 1974. At the time, he was the youngest U.S. senator ever elected in Vermont. Now the fifth-longest serving person in U.S. Senate history, he’ll return to Washington for his eighth six-year term. Full story here. Update 8:01 p.m. The AP has called the Vermont Congressional race for Peter Welch, who was both the Democratic and Republican candidate. His opponent was Liberty Union Candidate Erica Clawson. Welch will return for a sixth term in Congress. 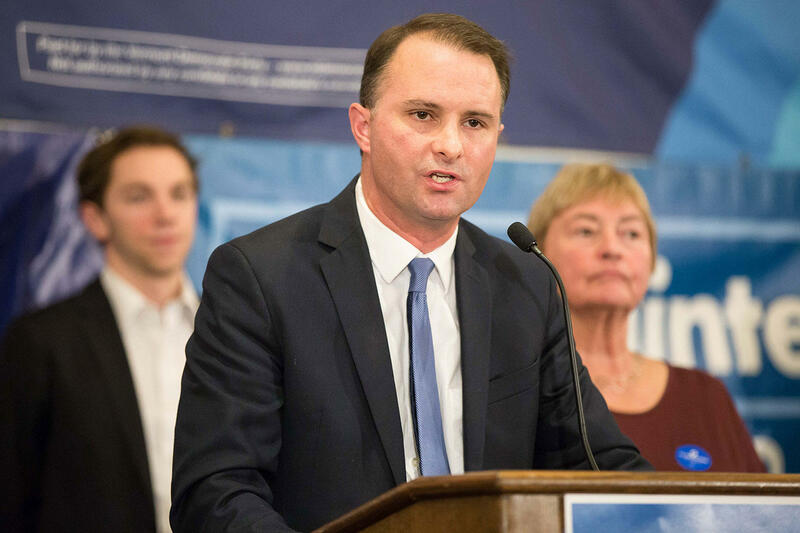 In his speech to supporters at the Vermont Democrats’ election headquarters at the Hilton Hotel in Burlington, Welch thanked Sen. Bernie Sanders, and got big cheers when he mentioned Sue Minter, the Democratic gubernatorial nominee. Hear Rep. Peter Welch's full victory speech. Update 7:38 p.m. We’re watching five “mirror towns” that have a history of picking winners in the governor’s race: Bethel, Bristol, Cambridge, Jericho and Randolph. Update 7:25 p.m. AP called U.S. Senate and presidential races based on exit polls. First votes are just now being tallied by Secretary of State’s office. 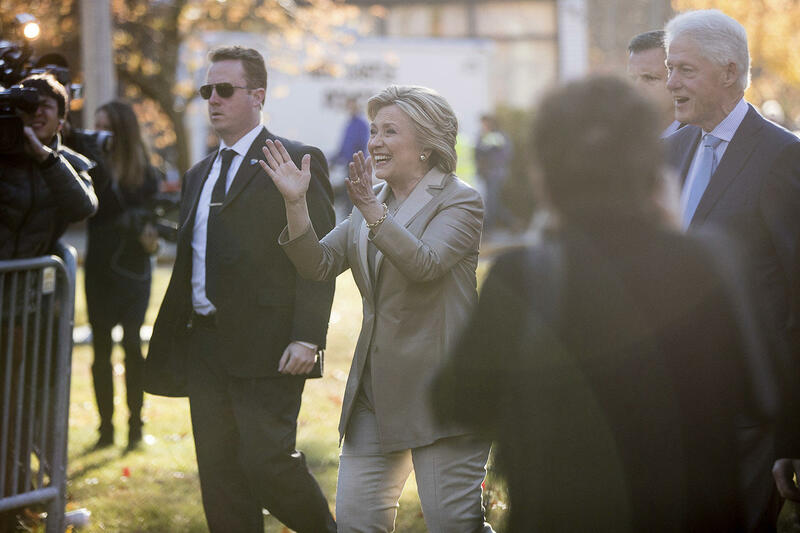 Hillary Clinton, accompanied by her husband former President Bill Clinton, greets supporters in Chappaqua, N.Y. after voting. The Associated Press called Vermont for Clinton shortly after the polls closed. Update 7:02 p.m. No big surprise: The Associated Press calls Vermont for Hillary Clinton. Final vote percentages will take a while to sort out — including how many write-ins for Sen. Bernie Sanders. An election day robocall effort, urging Vermont voters to do just that, was apparently spearheaded by a California man. The AP has also called the Senate race for incumbent Sen. Patrick Leahy, who was facing a challenge from Republican Scott Milne. Update 6:43 p.m. As the votes are counted, party faithful and many candidates are gathered in Burlington. The Queen City location is a departure for Republicans, who usually make their election night home in Montpelier. This time, they’re at the Sheraton Burlington. Democrats are at the Hilton Burlington and Progressives are gathered across the street at the Skinny Pancake. 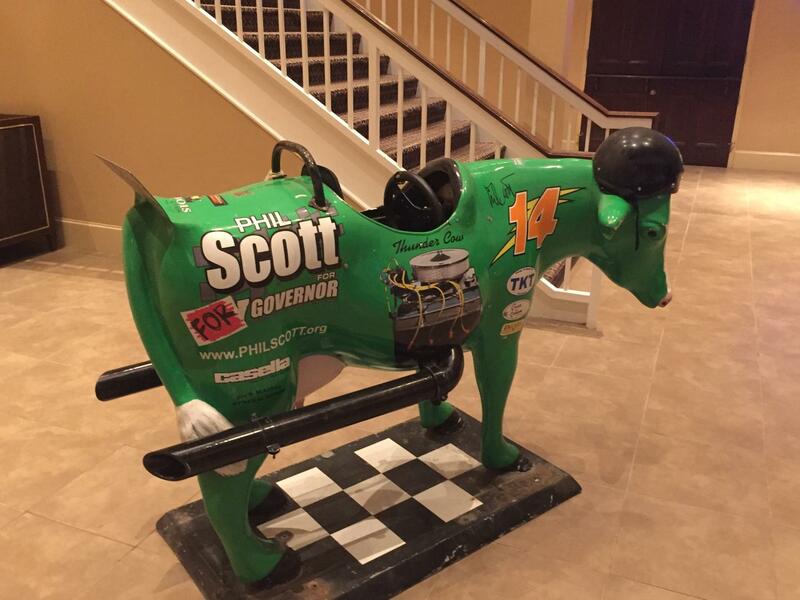 This cow/race car sits in the lobby of the Sheraton Hotel in Burlington, where Vermont Republicans are readying for their election night rally. 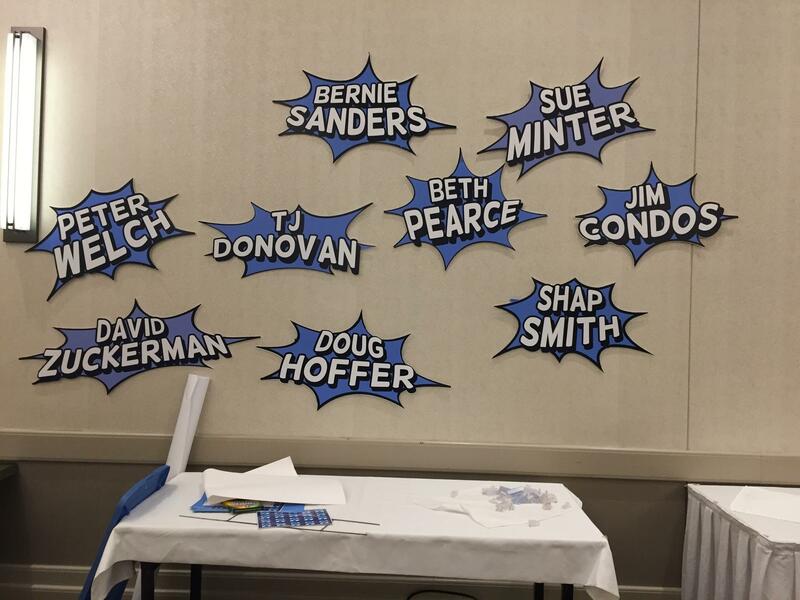 Dynamic signs with the names of Democratic candidates and figures at the Hilton Hotel in Burlington, where that party is preparing to watch the results come in. Update 5:15 p.m. Secretary of State Jim Condos says turnout appears to be track to set a record. As reported earlier, voter registration has broken the previous record, but Condos says the number has continued to climb. Secretary of State Jim Condos says he believes it is legal for a voter to take a photograph with their ballot because Vermont election law does not expressly prohibit this practice. Election Day is finally upon us. And here in Vermont, at least, the big electoral suspense is the neck-and-neck race for governor. You know that feeling where your body is like a clenched fist and everything is darkness but also on fire? Welcome to the final days of election 2016. We're talking to psychologists about election anxiety, where it comes from, and what you can do about it.